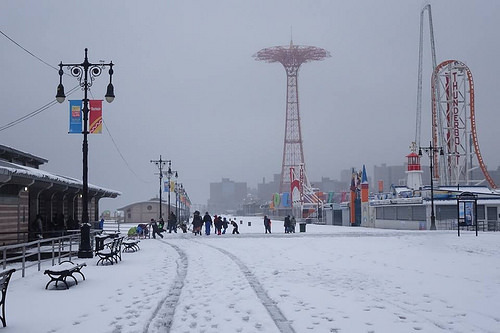 A snowy night in Coney Island illuminated by the Parachute Jump is as much of a photo op as the beach and boardwalk on a summer’s day. 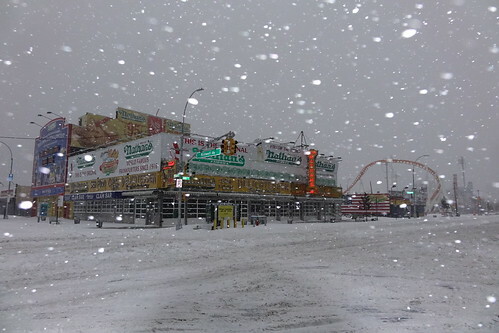 Coney possesses a quiet beauty on a snowy day or night. 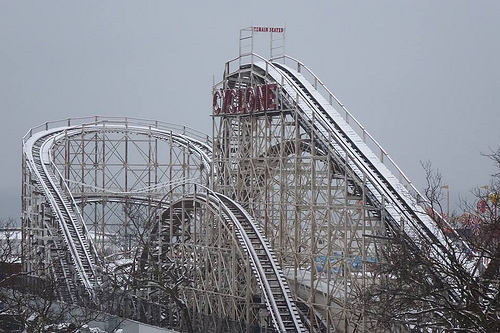 This week’s first snowfall of the winter was photographed from the shore by Coney Island resident and Polar Bear Club member Bruce Handy. In past years, ATZ has posted Bruce’s first snow of the season photos in late January, December and in October 2011 during the rare weather event known as Snowtober. 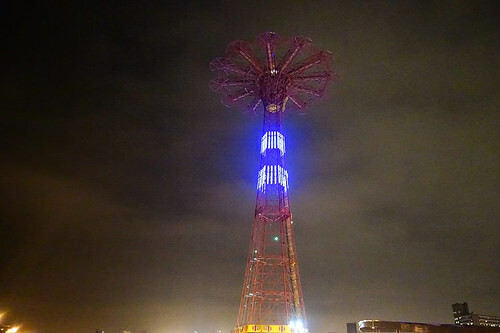 Ever since The Parachute Jump’s dazzling 8,000 LEDs debuted in 2013, the landmark tower’s light show has continued nightly. Specially programmed lighting schemes have paid tribute to the two slain NYPD officers, raised awareness for childhood cancer, and celebrated holidays such as the Fourth of July and Christmas. On New Year’s Eve, the Jump’s LEDs will ring in 2015 with a simulated “ball drop” and light show. 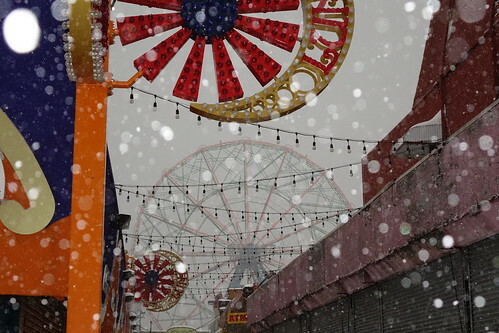 The annual tradition of putting a lighted cross atop the Wonder Wheel during the Christmas season began in 1945 to mark the end of World War II and the troops return home. 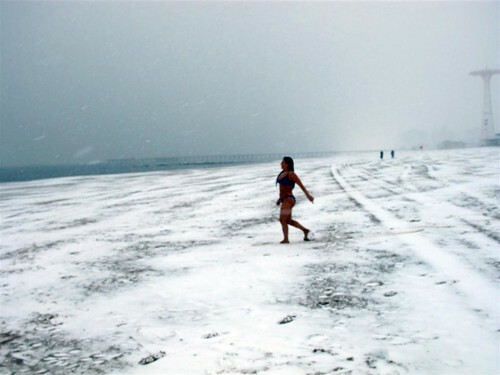 During the war years, Coney Island was dark after sundown because of “dim-out” and “blackout” regulations to protect shipping from being silhouetted for the enemy by the glare from the shore. 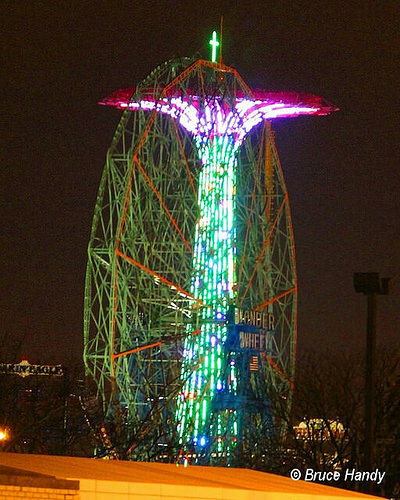 The new LED cross was made by DJ Vourderis, whose family has owned Deno’s Wonder Wheel Park for more than 30 years.